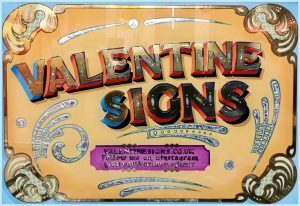 If you would like to commission a bespoke glass sign or discuss a potential project please email me at aaron (at) valentinesigns.co.uk or phone me on 07708820841. Are you interested in signwriting? Have a go yourself on Joby Carter’s 5-day signwriting courses.